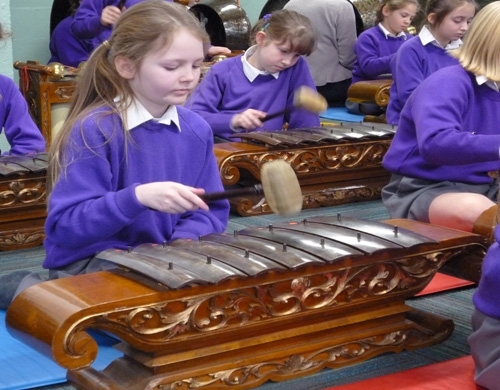 On Wednesday 29th January, Year 6 girls took part in a Gamelan workshop, run by Ian Bamford from Bolton Music Service. As there are only a small number of Gamelan instruments in this country, it was a rare and fascinating experience for Westholme pupils. The Gamelan originates from the islands of Java and Bali, in Indonesia, and consists mainly of tuned percussion instruments. The sound of these instruments is very unique and each one has been beautifully handcrafted. Mr Bamford gave the pupils a brief background to the instruments of a Gamelan orchestra, and demonstrated how each should be played, before pupils created layers of melodic patterns, called balungan, to create a wonderfully authentic performance.